The VirTual Pilot Lyophilizer is equipped with a larger condenser for larger product solvent loads. It is suitable for pilot scale work as well as small production runs. Shelf temperatures as low as -70C and condenser temperatures to -85C supports a wide range of applications. 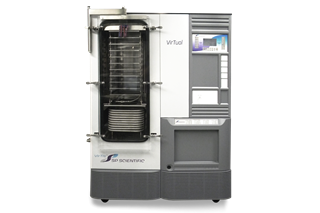 The VirTual is specifically designed for applications where high throughput and heavy vapor loads are required. Available in bulk or stoppering configurations and with up to 10 shelves. Each system is available with a selection of control formats and temperature and vacuum sensors. The 50 liter internal condenser configuration provides a high throughput capacity in a minimal footprint design. Configure the system to meet your needs. Choice of refrigeration, control and shelf and condenser configurations allows for simple to complex systems custom configured to meet your particular needs.